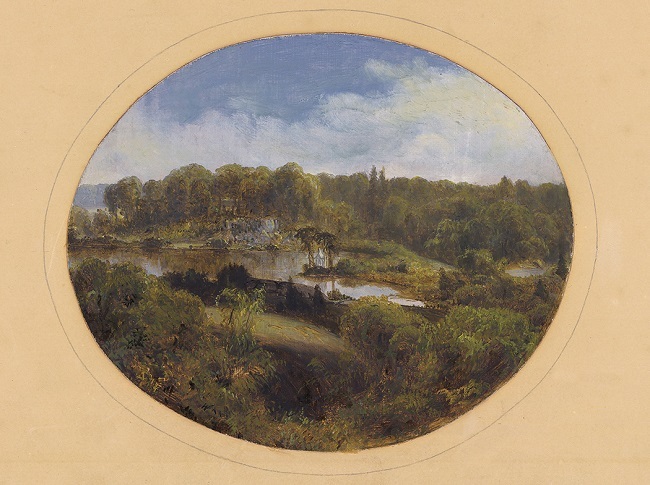 A rendering of the area surrounding the lake in New York’s proposed Central Park, 1858. Frederick Law Olmsted & Calvert Vaux, Greensward Study No. 5: View Southwest from Vista Rock on Reverse Line of Sight from Study No. 4. Courtesy of the NYC Municipal Archives and digitally enhanced by Library of America. One of Frederick Law Olmsted’s earliest and most enduring mentors was the landscape designer Andrew Jackson Downing. The two men met in 1846, shortly after Downing had published his latest book, Fruits and Fruit Trees of America. At the time, Olmsted was a 24-year-old apprentice at Fairmount, a famous upstate New York farm owned by agronomist and politician George Geddes. Ten years Olmsted’s senior, Downing had just been hired as editor of a new magazine, The Horticulturist, and the two men soon initiated a correspondence about the care of trees—fruit trees in particular. Downing’s advice and support proved invaluable. After purchasing a farm on Staten Island in 1848, Olmsted planted more than a thousand pear trees, won “First Prize for Pears” at a local fair, and, in 1852, published an article on pear culture in The Horticulturist. 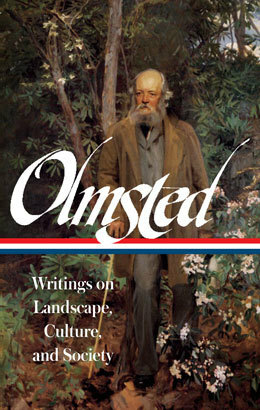 It was the beginning of Olmsted’s lifelong obsession with trees. Downing was an early proponent of open spaces in urban settings and an insistent advocate for the creation of a large park in the middle of Manhattan. Unfortunately, in 1852, soon after publishing Olmsted’s article on pears in his magazine, Downing was killed, along with eighty others, when the steamboat Henry Clay, carrying five hundred excursionists, burst into flames and crashed onto the bank of the Hudson River. The year after Downing’s death, the New York legislature finally agreed to develop a 67-block stretch in central Manhattan for the city’s Central Park, and in 1857 Olmsted teamed up with Downing’s surviving business partner, Calvert Vaux, and submitted the winning design. Note: The “pamphlet prepared by an eminent physician” mentioned on page 590 is Public Parks: Their Effects upon the Moral, Physical and Sanitary Condition of the Inhabitants of Large Cities; with Special Reference to the City of Chicago (1869), by John Henry Rauch. I am looking upon a crooked, hill-side village street, lined with trees. . . . If you don't see the full selection below, click here (PDF) or click here (Google Docs) to read it—free!